Get ready to zoom into action with your favorite friends Lightning McQueen and Mater in this LEGO DUPLO Cars Disney Pixar Cars Classic Race! Little drivers can use the big, colorful LEGO DUPLO bricks to build the starting gate, and let the fun begin when you drive Mater and Lightning McQueen to the starting line! Make a pit stop to make adjustments with the wrench and fill up at the fuel station, then race head to head to the finish line. Who will win the Piston Cup in this LEGO Cars set? Future racing stars will love creating stories with best friends Lightning McQueen and Mater in this easy-to-build model, with big bricks designed to be safe for little hands. 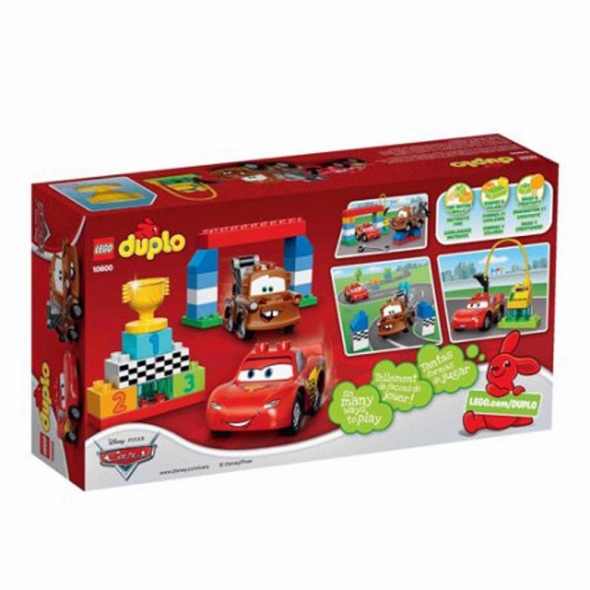 Use the decorated number bricks to reinforce early counting skills and encourage kids to use their imagination with the checkered flags, wrench and Piston Cup to bring their favorite Cars stories to life with this LEGO DUPLO set. Includes Lightning McQueen and Mater LEGO DUPLO figures.